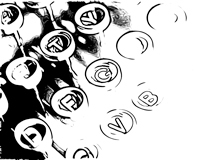 Recently, I added Google+ to my armory of social media marketing. I did have an account set up but it was linked to YouTube after Google bought them out. This would not be a problem if my son was not so into watching and commenting on Mind Craft videos on YouTube. Unfortunately, those comments were showing up on my Google+ profile which does not look good on a professional page. Let’s talk about providing top notch customer service and what it can do for your business. We have just come through the holiday shopping season and a couple of really big customer service let downs have prompted me to write this post. Without going into the reasons why I will never again order from a couple of online retailers, I would like to share some ideas about good customer service. 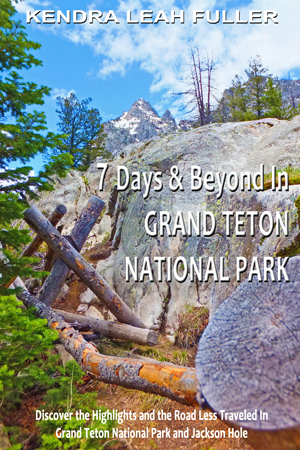 Click to print or save for a quick reference when you’re planning your trip to Grand Teton National Park. No matter what your fitness level, there are many hikes to be enjoyed in Grand Teton National Park. Best of all, you do not have to be a mountain climber to enjoy the beautiful vistas, canyons, and waterfalls in the park. Weather can and does change rapidly in the mountains. Take along extra clothing when hiking into the higher elevations, wear sunscreen, and take plenty of water and high energy snacks. If you are planning a long hike, start in the morning and keep your eye on the time. You do not want to be caught on the trail after dark. You will notice these signs everywhere in the park. Take them seriously. At certain times of the year, some trails may be closed due to increased bear activity. Park rangers put on bear safety presentations which you should consider attending. Whenever you are hiking in the park always take along bear spray, know how to use it, have it immediately available, and talk or make noise while you hike. Never hike alone. This flat, 2.0 mile loop trail follows the shoreline along a peninsula in Colter Bay. You will enjoy beautiful views of Mount Moran across Jackson Lake and reflections in Colter Bay. The trail begins on a paved service road near the boat docks at the Colter Bay Marina. If you enjoy waterfowl, wildlife, and water lily covered ponds, this hike is for you. Look for trumpeter swans, beaver, moose, and bears. This relatively flat hike starts at Colter Bay Village and is a 3.0 mile loop. There are many reasons you may be considering taking out a business loan. 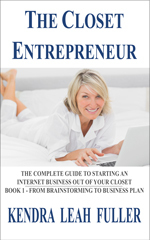 Perhaps you need start-up capital for your new business or are looking to expand your existing business. No matter what your reason for additional capital, I urge you to tread cautiously before taking out a small business loan. As entrepreneurs, we are generally optimistic. Optimistic that our start-up will be a success. Optimistic that our business is going to grow. Many of us tend to focus on the positives and only deal with the negatives when they happen. We mistakenly think that we have total control over the destiny of our business. While you may control most things, you do not control all. Before you take out a loan, I want your eyes to be wide open to the pitfalls. 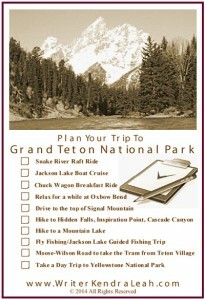 Click to print or save as a quick reference for planning your trip to Grand Teton National Park. I have truly lost track of how many times I have vacationed in Grand Teton National Park. I think it might be six? As we climb towards Togwotee Pass after leaving Dubois and entering the Shoshone National Forest, I am on the edge of my seat with each new bend in the road thinking this will be the one that finally reveals the Tetons in all their majesty. It is a wondrous site to behold. It never fails that I find myself wondering what it must have been like to be a fur trapper or explorer who had just climbed this far only to see the massive Tetons looming before them across the valley floor of Jackson Hole. I think I would have decided this is where the journey ends and taken out a claim at the base of the Tetons. 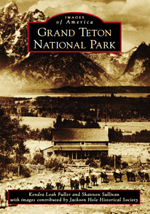 The Closet Entrepreneur has been on hiatus for a year while I completed my manuscript for Images of America: Grand Teton National Park. I apologize for the interruption – now back to business. It’s that time of year again. The start of a 2014. The traditional time for making resolutions. I’m keeping one of my resolutions right now by writing this post.